It has been revealed that the two men suspected of killing the 25-year-old had been part of previous investigations. A MAN SEEN with bloody hands wielding a butcher knife after the killing of a British soldier on the streets of London was described as a convert to Islam who took part in demonstrations with a banned radical group. 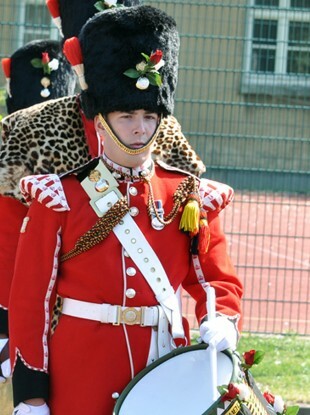 Police raided houses in connection with the brazen slaying of the off-duty soldier, identified as Lee Rigby, of the 2nd Battalion The Royal Regiment of Fusiliers, who served in Afghanistan. In addition to the two suspects who were hospitalized after being shot by police, authorities said they had arrested a man and a woman, both 29, on suspicion of conspiracy to murder. Police would not say whether it appeared Rigby had been targeted specifically because of his military service. Although he was not in uniform at the time he was killed, he was said by witnesses to be wearing a T-shirt for a British veterans’ charity. Authorities have not identified either of the two wounded suspects and have not said when they would do so. Anjem Choudary, the former head of the radical group al-Muhajiroun, said that the man depicted in startling video that emerged after Rigby’s death was named Michael Adebolajo, a Christian who converted to Islam around 2003 and took part in several demonstrations by the group in London. Omar Bakri Muhammad, who now lives in Lebanon but had been a radical Muslim preacher in London, said he remembers Adebolajo as a “shy person” who was keen to learn about Islam and asked interesting questions. Mary Warder, who has lived in the Woolwich area for more than 30 years, said she had seen both of the suspects preaching on the streets. Shopkeepers, however, said they couldn’t remember seeing them. The two men suspected of killing the 25-year-old Rigby had been part of previous investigations by security services, a British official, as investigators searched several locations and tried to determine whether the men were part of a wider terrorist plot. Rigby, the father of a 2-year-old boy, was slain Wednesday afternoon in the Woolwich area of south London while horrified bystanders watched on. The bizarre scene was recorded on witnesses’ phones, with one of the two suspects boasting of their exploits and warning of more violence as the soldier lay on the ground. Holding bloody knives and a meat cleaver, they waited for the arrival of police, who shot them in the legs, according to a passerby who tried to save the dying soldier. Email “Police unsure if decapitated British soldier was targeted or not”. Feedback on “Police unsure if decapitated British soldier was targeted or not”.